en nenjamE – Oh my heart! sengaNmAl kaNdAy – look at the emperumAn who has reddish lotus like eyes. thAne kaNdAy – look! they are all emperumAn himself! thiRambAdhu kadaikkatpidi could be added in the end [of the verse] to get the meaning. Or, it can be recited together as in thiRambAdhu aRam pAvam enRu iraNdum AvAn to get the meaning. Alternatively, thiRambAdhu en nenjamE could be considered as it is and meaning can be obtained. Oh heart! You, who are carrying out whatever I tell you, without any mistake! Oh heart, who says unless I see emperumAn I will not go back! en nenjamE – Oh heart, who keeps asking me to tell everything! sengaNmAl kaNdAy – look at emperumAn who has lotus like eyes. chAndhOgya upanishath 1-6-7 says “thasya yathA kapyAsam puNdarIkam Evam akshiNI” (emperumAn’s eyes are like lotus just blossomed by sun); nammAzhwAr in his thiruvAimozhi 6-7-10 says “anaiththulagum udaiya aravindhalOchanan ” (the lotus eyed (emperumAn) has all the worlds). Alternatively, sengaNmAl could be taken to mean having reddish eyes out of affection for us, his followers, and hence we can take it that AzhwAr is asking his heart to look at emperumAn who has reddish eyes due to overflowing affection for us. aRam pAvam enRu iraNdum AvAn – he [emperumAn] himself is both puNyam (virtuous deed) and pAvam (bad or sinful deed). His anugraham (kindness or liking) is puNyam and his nigraham (disliking) is pAvam. There is nothing else apart from these two which would give the benefits [of our actions]. All are under his disposal only. kaushIthaki upanishath 3-9 says “Esha Eva sAdhu karma kArayathi” (emperumAn himself makes us perform good deeds). AzhwAr will not hold on to deeds which do not make sense as means as he avoids both action and activity as emanating from him (Isn’t he one who holds on to emperumAn as the means!). Looking superficially, it would appear that puNyam and pAvam are different from him. But if one were to look at things deeply, it would be clear that he is the one who controls everything. puRandhAn immaNdhAn maRikadaldhAn mArudhandhAn vAndhAnE kaNdAy – all are under the disposal of emperumAn. 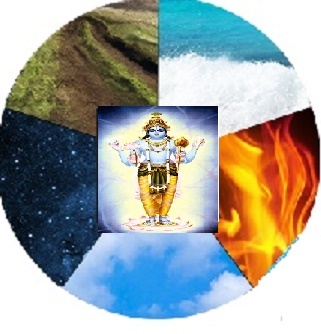 maN (earth), maRikadal (agitating ocean, with lapping waves), mArudham (breeze), and the entities which are outside these elements such as mahAn (great entity) etc are all his manifestations, says the AzhwAr. AzhwAr tells his heart to hold on to the fact that emperumAn is the chEthanan (sentient entity) with the body. Or, kadaikkaN – hold on to this till the end, without any error. nammAzhwAr has also mercifully said this in his thiruvAimozhi 6-9-7 “ulagil thiriyum karuma gadhiyAy ulagamAy ulagukkE OruyirumAnAy” (you are the deeds, the entities which carry out the deeds and the life of these entities)! When emperumAn’s independence is absolute without any shortcoming, how can the chEthana (sentient entity)’s thinking that he is independent be congruent? The fact is that chEthana is never independent; it is just that he thinks that he is independent. In mahAbhAratham uththara kANdam 42-35 it says “ya: anyathA santhamAnam AthmAnam anyathA prathipadhyathE” (whoever thinks that emeprumAn’s possession of AthmA is his…). Even when chEthana thinks that he is independent, due to the grace of emperumAn, the chEthana’s nature is not destroyed. We shall consider the 97th pAsuram next. This entry was posted in iyaRpA, mudhal thiruvandhAdhi on September 15, 2017 by T N Krishnan.